This is the time of year where we reflect and prepare for the upcoming year. It is a special time of year where we are able to unplug from most of our obligations, and return to our most intrinsic desire to achieve our aspirations. Many people are faced with the struggle as to how they are going to stay motivated for the long-term, and understand how they are going to focus on the prize with a myriad of distractions. The greatest perspective that can be provided to you is that distractions will always be around us, for it is up to us as maturing individuals to maintain focus and achieve the objective. 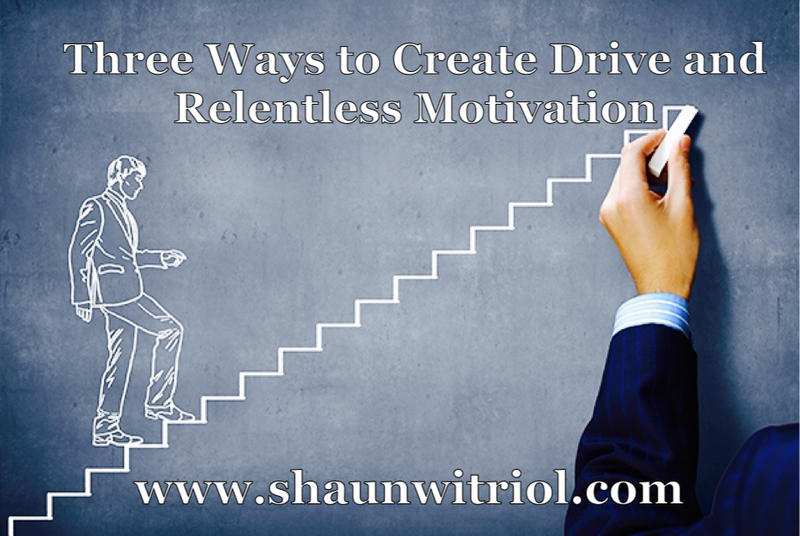 Here are three ways to create drive and relentless motivation through the holidays and into the new year. These ideas will help propel you to make this upcoming year your best year ever! 1) Focus on What You Want Most – this new year is an opportunity for you to review your life, and to carefully plan out how you want to reach the next step in your life. Your life is the sum of all of your decisions to this point, and the best part about this situation is that there is always room for improvement, and there is always an opportunity to right a wrong. You simply have to believe in your vision, and you have to believe that you are 100% capable of doing what ever you set your mind to achieve. Remember you body follows your mind, so if you believe you can…you will. 2) Take Time to Reflect on Your Growth – We cannot truly appreciate the culmination of our success if we never take the time to view the path life has given us, and we will never be able to change the course of our situation if we cannot understand the magnitude of our growth. Life is not only a journey, for it is an evolution. We never end up the same way we start, and we need to understand that our own guidance is the key to our success. Our growth process starts with the understanding that individual development never stops, and neither can we. It is up to us as individuals to continuously develop our knowledge base into something that can be molded into a personal library. Accrue information without recourse, for the more we know and the more we learn the better we are able to handle any situation. The easiest way to complete this task is to find something read everyday. The most successful people read inspiration books that create a level of vigor that cannot be replicated. Take time to learn something everyday, and you will be surprised with the amount of information that will accrue in simply a year’s time. 3) Have Higher Expectations of Yourself – A goal is great, for it sets the mood of what you wish to achieve, and what you wish to become. The key significance to a goal is the understanding that this is simply the beginning. The most successful people not only set goals, for they raise the bar once they have achieve their goal. They understand that the process never stops, and that in order for them to reach what they want they have to raise their own standards. They never settle for second best, for they know that no one remembers the person that finishes in second place. History only remembers the winners, and only the winners are history. A great example of this would be the Wright brothers, the pioneers of flight from North Carolina. There were over 100 companies and individuals trying to achieve flight for the first time in history, and two bicycle makers from North Carolina beat multi-million dollar companies to achieve a 7 second flight that changed the way people travel forever. Can you name the person that was most widely publicized as the favorite? I can’t, and it does not matter, for the lesson to be learned here is that achievement of the objective is the only thing that matters in this process. History caters to the victors, and you must believe you are a victor. It is often difficult to create motivation for an area of life that you do not enjoy, because you cannot pursue something that you do not have an intrinsic love. Find something that you love, and would do for fun. Work for something that you wish to achieve because you want it more than a paycheck. Business leaders work to lead people to reach their dreams, and you can reach your own dreams by understanding the depths of your own priority. Achieve each step one objective at a time, and you will learn what you are truly capable of in life. Make this your best year ever. ← Build Trust. Build Chemistry. Build an Organization.